Yesterday our MD Stephanie and Brand Manager Emma went down to London to attend the awards ceremony at ExCel London. And guess what? Kegel8 Award - Guess What? - We won! We were up against some tough competition so we're ecstatic to have won this award! It's fantastic to be recognised on a national level for the success we've had in bringing Kegel8 to women right across the UK. 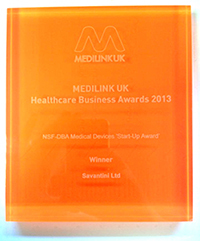 Medilink UK supports healthcare technology businesses like us and has helped to guide us through the complex world of health product innovation so that we can get Kegel8 out to as many people as possible. We've had so many messages of thanks from women and men who have regained control, sensation and confidence after coming to Kegel8 and it's wonderful to know that we've made a difference to so many people's health. With this Kegel8 Award from Medilink under our belt it's just onwards and upwards from here as we expand throughout Europe and the rest of the world to convert women everywhere into Kegel8-ers. That is, of course, after we've celebrated with Kegel8 cupcakes made with love by our European Brand Co-Ordinator and baking wizard Heather!